A DEATH THREAT made against an Irish soldier based in Donegal is currently being investigated. 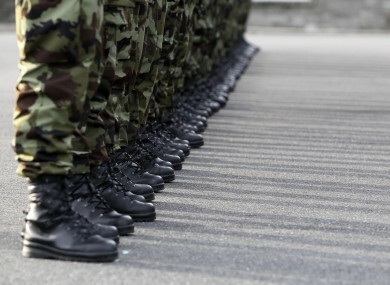 The Defence Forces confirmed to TheJournal.ie that allegations of a threat against a serving soldier in Donegal are being investigated by the security forces. The soldier has allegedly been threatened by a terrorist group and the authorities are taking the situation seriously. What I will say is that there is real and persistent threat on this island from some small groups who are prepared to use violence in order to oppose democracy and peace. These so-called ‘dissident republicans’ are no more than criminal terrorists who are deeply and inextricably involved in serious crime in order to fund their activities and their lifestyles. No matter whom their threats and actions may be directed against, their activities are reprehensible and are to be condemned outright. The Garda authorities, working in close co-operation with their counterparts in Northern Ireland, will continue to take strong action to combat the threat these groups present. The Defence Forces said that appropriate action has been taken by the gardaí and Military Police Investigations and investigations are ongoing. They added that it is not appropriate to comment further on security matters at this point in time. Email “Terror group make death threat against Irish soldier”. Feedback on “Terror group make death threat against Irish soldier”.